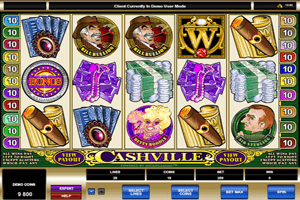 Take a trip to Cashville, where the rich people live, place your bets and spin the reels so you can get to claim your own share of their riches and fortunes. The entire game is themed around money, for example, the symbols that spin on the reels and lines of the game include stacks of dollars, stacks of European currency, cigars and golden currency, a bonus coin, a rich billionaire, Sir Sterling, a rich lady and Betty Boodie. These symbols appear spinning on the game’s 20 winning lines and 5 reels. The stakes that players want to place can be found at the bottom. Players will place them by going through the offered banking options, these options are the number of lines, the coins’ value and the number of coins. After the stakes are placed, players will be able to spin the reels so they can start earning great rewards. Apart from the line payouts, there are plenty of special and bonus symbols, these symbols include the wild symbol of the game that can help players increase their winning chances by substituting for any of the other icons, except other special symbols. This symbol is none other than the Golden W symbol. The Golden S symbol is the scatter icon that will reward players in multiplied scattered rewards. There is also a bonus round that is activated when players get 3x Bonus coin symbols on the reels. They will choose one of the billionaires and enter the Cashville bonus round.